Young woodlands need to be thinned to allow to allow the remaining trees to reach their full potential but this can be a time consuming and expensive operation. By contrast girdling is a very quick and inexpensive way of thinning that has silvicultural and ecological advantages as well. Trees can be quickly girdled by holding a chainsaw against the tree at waist height and cutting through the bark as you walk around the tree. Often, simple girdling is not enough to kill the tree, so a suitable herbicide should be applied to the cut all around the tree. When trees are girdled in the winter they will usually come into leaf the following spring. Some vigorous species such as Sycamore, Acer pseudoplatanus, may produce leaves for two summers after ring-barking. As the tree slowly dies it first sheds its leaves, then the smaller twigs and branches. Three years after girdling most trees have a stem that is sound and perfectly dry, ideal for firewood as it needs no further storage and can be taken straight from the wood to the stove. Girdled broad-leaved trees can be felled very quickly because they have few branches to get hung up on their neighbours. A typical girdled tree will remain standing for 5 years or more until root decay makes it topple. Fast growing trees such as birch, alder and poplar stay wet after girdling and soon start to degrade. 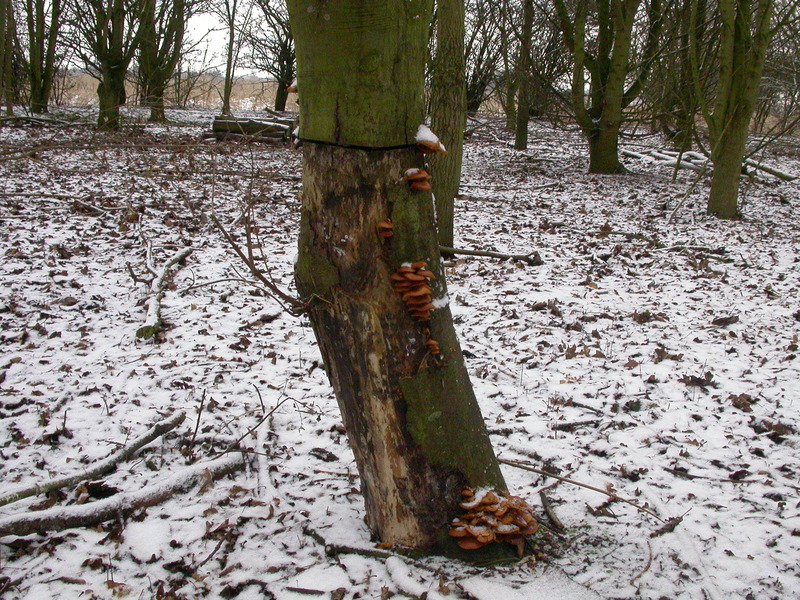 These girdled trees are superb for wildlife if allowed to rot, but if the timber is required for firewood or other uses they should be felled conventionally. Conventional felling produces sudden gaps in the canopy that increase the exposure of neighbouring trees to sun and wind . This sudden exposure can cause a check in the growth of trees. Oaks often produce epicormic shoots after a thinning – this reduces the value of their timber. By contrast girdling slowly opens gaps in the canopy over several years as the girdled tree dies, allowing the crowns of neighbouring trees to grow into the space provided. Girdling results in a natural process similar to a tree dying slowly of disease. A complete woodland ecosystem requires standing and lying dead trees at all stages of decomposition. This can be achieved by girdling but not harvesting the trees. If possible girdled trees should be left to provide the valuable and scarce habitat of standing dead timber. 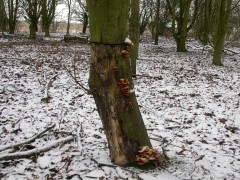 This is a particularly rich environment for insects and fungi as well as woodpeckers and other wildlife. When the tree eventually falls it becomes lying dead timber. It becomes moist and decay is hastened by a new assemblage of insects and fungi. Organic matter is incorporated into the soil and the woodland begins to build up its carbon storage. At Aveland Trees we have experience in selecting trees for thinning. We can girdle the selected trees and give advice on harvesting for firewood. Aveland Trees » Why Should I Thin Young Woodlands?